What better way to explore Venezuela’s Lost World? 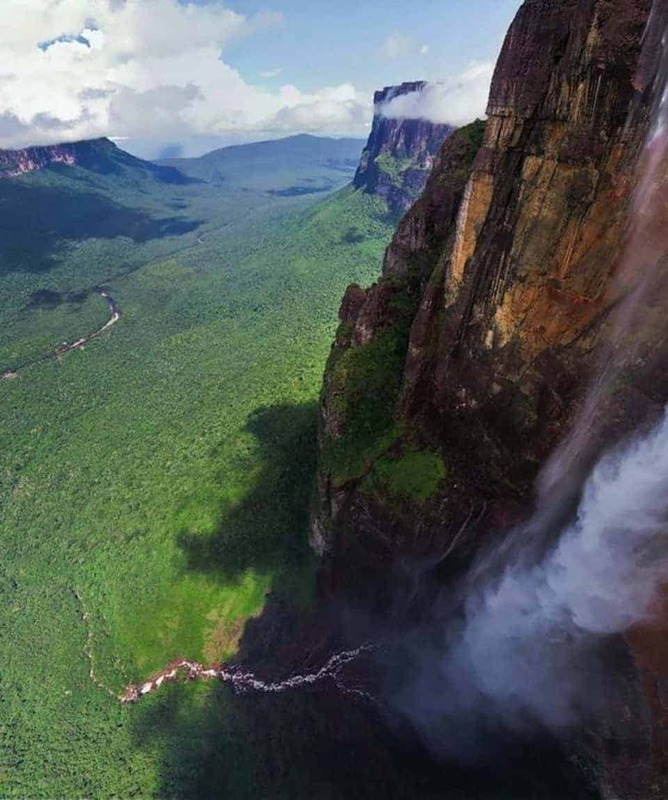 Climb to the summit of Auyán-Tepui: The imposing tabletop mountain that is home to the world’s highest waterfall. 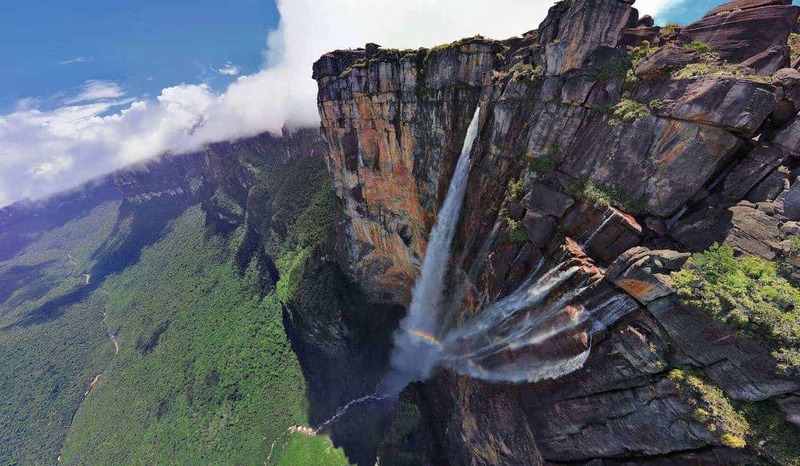 Then: spend two days abseiling down all 979M of the incredible natural phenomenon that is Angel Falls. 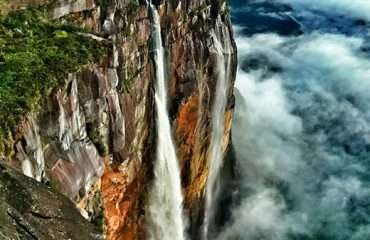 All about the Abseil The World’s Highest Waterfall, 8 Days, Abseiling Tour, Venezuela. Why Do We Recommend It? This is perfect for those that seek-out adrenaline rushes. It’s an opportunity to push yourself, but also a chance to experience the beauty of the region and its culture. You come away with a unique achievement to be proud of. Experienced and trusted tour operator. This is perfect for thrill-seekers and people that want to push themselves. 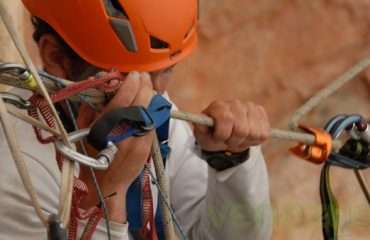 Experience with abseiling is beneficial, however, you will be fully supported and trained during the expedition. We will start to communicate with you from the moment you enquire with us and will make sure you are ready before signing you up. An incredible trip in a lost world climbing rocks, crossing rivers, forests and jungles. Every day different scenery and new adventures out of a fantasy book. Spectacular abseiling! My heart still skips a beat when I remember the moment I looked down the waterfall. 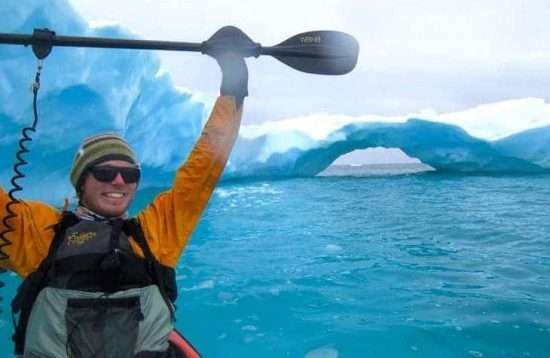 This is a fully supported expedition, so we have established a target date and will update that as soon as we can. However, if this date is not possible for you, let us know and we can discuss options for a bespoke trip. What is included in this tour?Items that are included in the cost of tour price. Professional expedition leader with full medical and communications kits. All food (snacks and meals) and soft drinks. All transport as outlined in itinerary including airport transfers. Special permits and permissions if required. What is not included in this tour?Items that are not included in the cost of tour price. International flights/ travel to and from the start and end points. Tips to local guides (discretionary). Alcohol unless provided by hosts with meals. Personal equipment (full kit list in the Handbook). The following is the outline plan for this epic Venezuela expedition – the ‘substance’ rather than the specifics. A fuller itinerary is provided in the Venezuela Expedition Handbook which is available on request or upon application to join the team. You will be required to reach Simón Bolívar International Airport in Caracas on 3 February. You’ll be met on arrival and transported to the nearby team hotel where your expedition leader awaits. The expedition will officially start at 1700 with a safety briefing and talk through the expedition plan. Your first meal as a team will be dinner that evening. 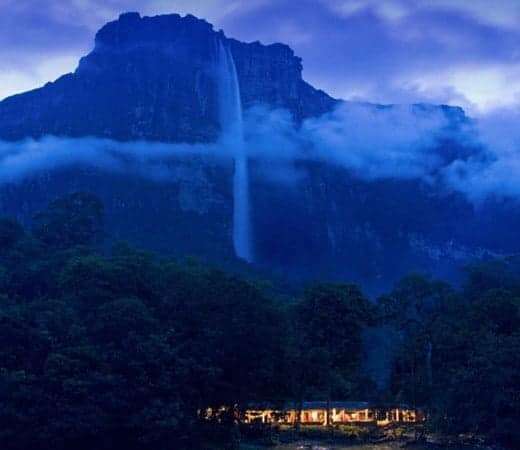 Next, you’ll take a commercial flight to Puerto Ordaz and a private small plane to Kamarata valley to reach a region just to the south of Auyán-tepui itself. 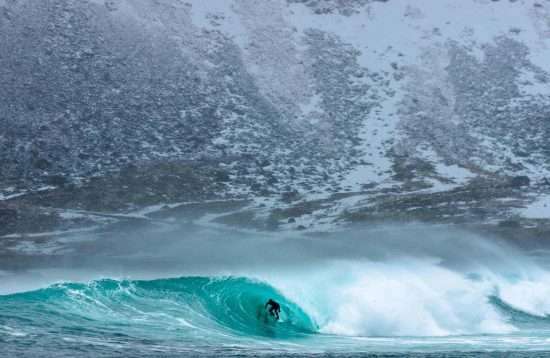 You’ll head to a remote lodge where you’ll be greeted by your local team and porters. Once all the equipment is organised your trek will begin. You’ll pass through the beautiful Kamarata valley, getting your first glimpses of the epic tepui. Your climb will then take you through thick jungles and across several escarpments and plateaux. The route is very steep at times, and scrambling techniques will be used along with using fixed ropes to ascend. You’ll reach the summit and camp right at the wall’s edge. It’ll then take a further five days of trekking and exploring to reach the point where the abseil starts. During this time, you’ll see spectacular waterfalls, pink sandy beaches, rock formations and rolling hills, along with the diverse wildlife that inhabits this other world. After a day of rest (where yours guides will be setting up the abseil), you’ll be briefed and trained on all aspects of the descent. 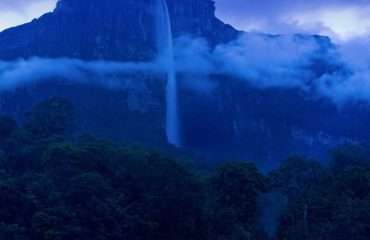 You will start the rappel very early in the morning when the longest pitches will be made and from which you’ll get the best views of the falls. You will camp on the rock face itself under a huge overhang, then continue the descent the next day. Abseil over: great work! Once down on the ground again, your team will have an arduous trek through the jungle to meet the Churun river. After a night in hammocks, you’ll take a curiara (motorized dugout canoe) to Canaima and stay in a jungle lodge right by the river. The next day you will board a flight to Puerto Ordaz and then head back to Caracas. You’ll enjoy the team’s final-night celebratory dinner at a hotel near the airport, and will be free to depart any time after breakfast the next morning on 16 February 2018. What better way to explore Venezuela’s lost world? Climb to the summit of Auyán-tepui: the imposing tabletop mountain that is home to the world’s highest waterfall Abseiling expedition. 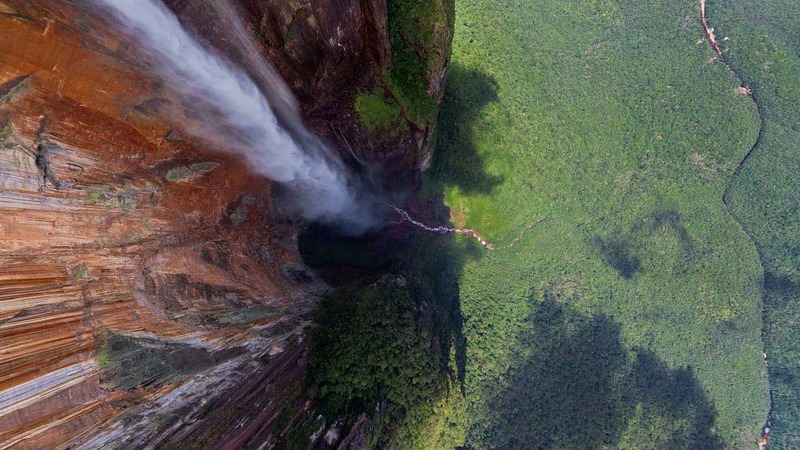 Then: spend two days abseiling down all 979m of the incredible natural phenomenon that is Angel Falls. 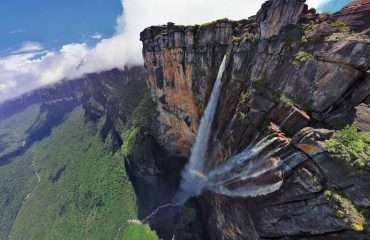 The aim of this epic expedition to Venezuela is to take a small team of adventurous travelers to become some of the very few people to climb the tabletop mountain (tepui) of Auyán-tepui and to abseil down the world’s highest waterfall, Angel Falls. 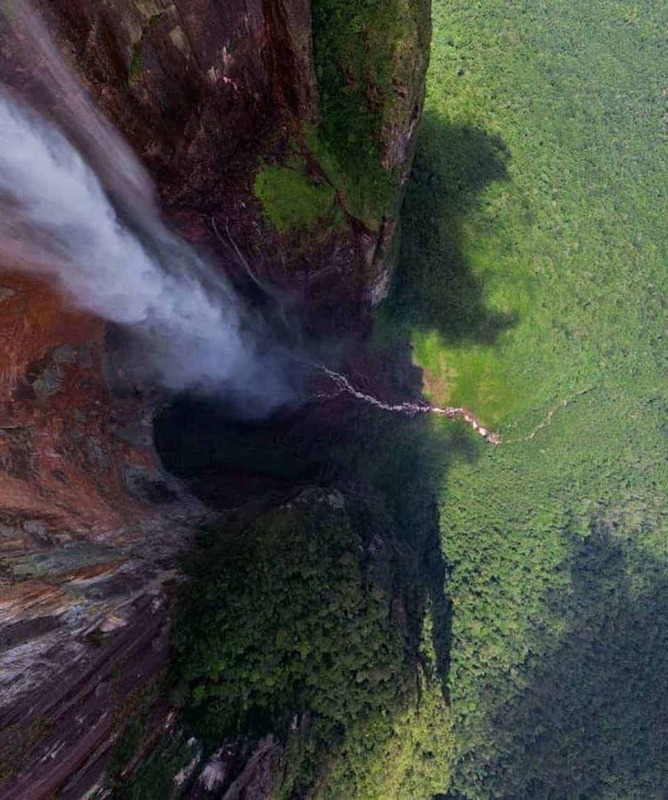 The 979m waterfall takes two days to rappel down over 23 rope lengths. 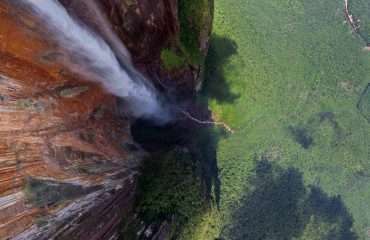 Watch this BBC Extreme Mountain Challenge Angel Falls episode for a closer look at these phenomenal falls. To get to the summit of this epic tepui you will trek and climb on the only known route to the top, which was charted in 1927 when a rescue attempt to the summit was launched to rescue American aviator Jimmy Angel when he crash-landed on the summit. 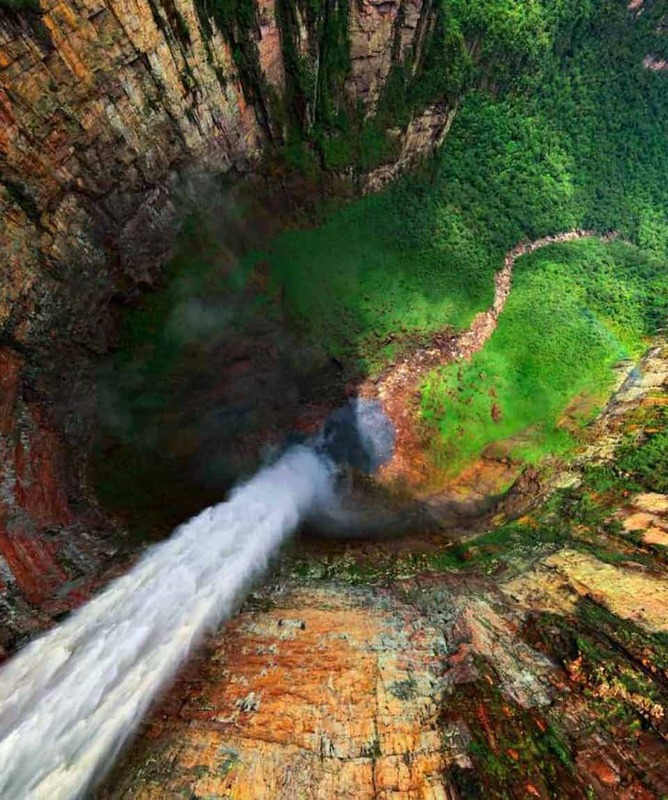 Abseil off Auyán-tepui down the 979m high Angel Falls, the highest in the world. 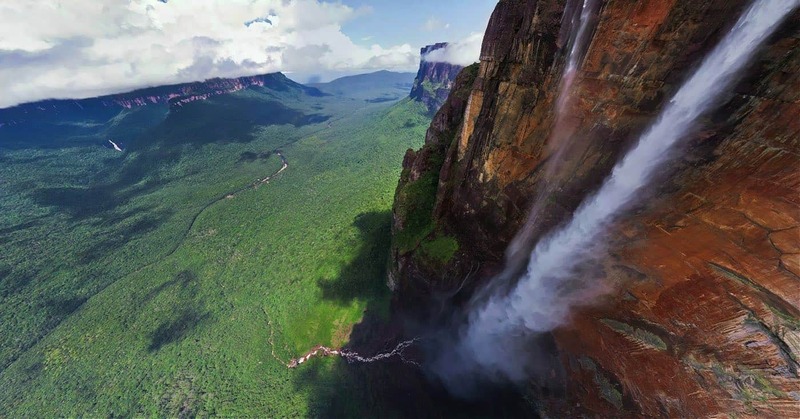 Trek and climb up to the summit of the tepui via the only route possible. Explore a region of made famous in Conan Doyle’s The Lost World novel. 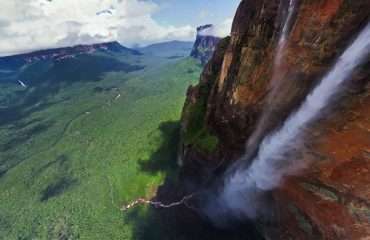 Travel and explore the Canaima National Park, a UNESCO World Heritage site. 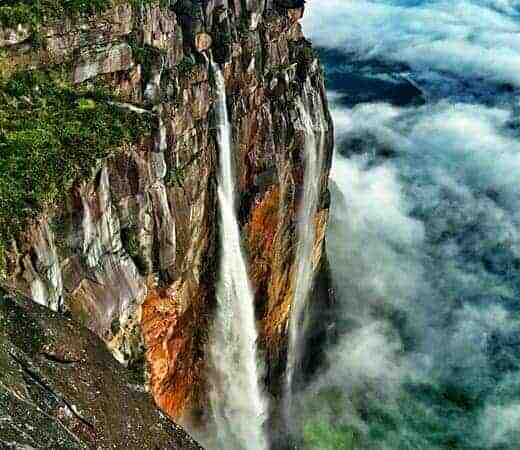 Very few people get to witness Angel Falls (Kerepakupai Meru) due to the remoteness of its location. 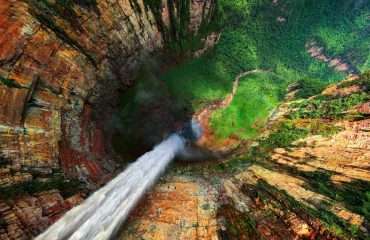 Even fewer get to abseil down the total length of the 979m long drop, which makes it the highest waterfall in the world. It is 15 times higher than Niagara Falls, and it will take two days and 23 rope lengths to descend the height. You will need to have a head for heights as you rappel off into free air with the falls gushing to earth besides you. 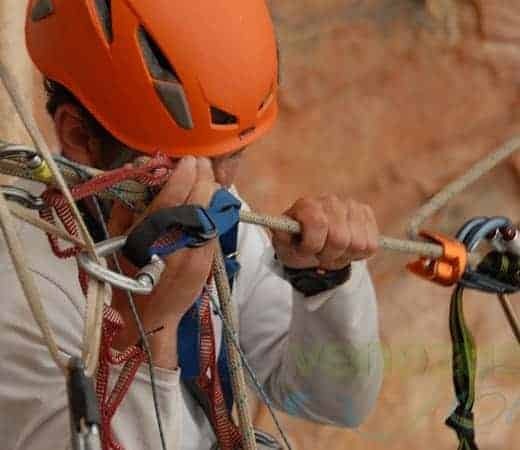 You will be looked after by expert guides who will ensure that this is very safe, and patience will be needed as we get all the team members down each rope length. 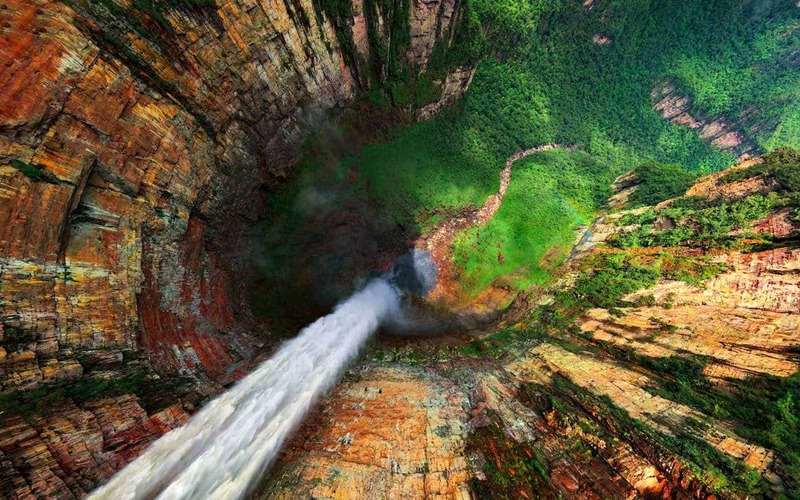 To reach the abseil, you must first climb to the top of the tepui. 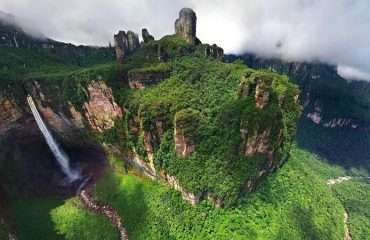 Auyán-tepui is the largest table-topped mountain in Venezuela, a sandstone mass that rises above the rainforest below. It was made famous in Arthur Conan Doyle’s 1912 novel The Lost World. Due to the difference in altitude, the ecosystem is different on the 700km2 area on top of Auyán-tepui and it hosts a variety of endemic species. All of our expeditions are achievable by anyone with a healthy lifestyle and a good level of general fitness. Team members should be willing to be part of a team working together to achieve the goal of the expedition. 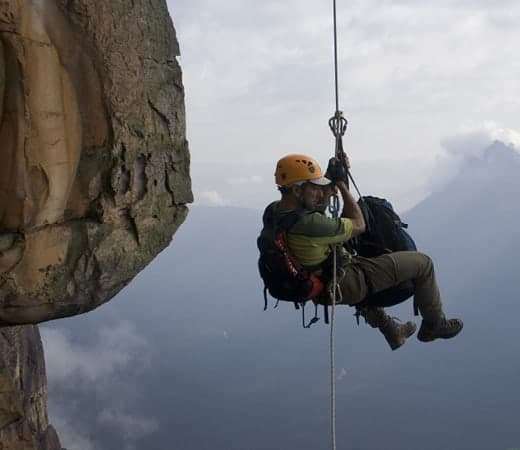 The biggest challenges on this expedition will be climbing the very steep route to the summit; dealing with the extreme exposure of abseiling off Angel Falls; sitting in your harness for long periods. Teammates who arrive without meeting the agreed minimum fitness requirements can jeopardize themselves and the expedition’s goal so do take training seriously, prepare as appropriate and arrive fit and ready to go. Teammates must be comfortable with the following. Trek: up to eight hours per day. Carry: up to 10kg per person in a daypack; porters carry your main bags. Abseil: off sheer vertical cliffs and at times over overhangs with no wall at all. Terrain: varied. Through deep and dense jungles and up very steep paths. You’ll ascend sometimes using the aid of fixed ropes and scrambling techniques. Climate: temps averaging 26C to 28C with high humidity and cooler at the summit. This is one of the longest and most extreme abseils in the world so previous experience of abseiling is necessary for this expedition. You must be completely confident of tying and clipping into anchors and using your rappelling equipment. If you have no prior experience this is not a problem as you will be able to learn these techniques prior to the trip: there are many climbing walls that can run bespoke training sessions to teach you these required skills. Applicants will receive a Handbook with further expedition information, this is currently being finalized and will be sent to applicants on its completion. There will be a variety of hotels and lodges at the start and end of the expedition that the team will stay in on a twin-share basis. Teammates can leave a flight bag (at own risk) in a Caracas hotel at the beginning. Throughout the expedition the team will be camping in technical tents shared between two, and in jungle hammocks for one night on completion of the abseil. In the hotels and lodges there’ll be a variety of delicious local meals. On the tepui, fresh food and hot meals will be prepared by the expedition’s local team. Though sufficient calories in terms of meals and snacks will be provided, teammates are advised to bring a few favourite snacks or bars to keep spirits high. Team members are responsible for international flights to Caracas. Hotel transfers are included in the expedition cost as are all forms on internal transport including several flights once the expedition begins and until it ends. One internal flight is on a small-propeller private plane to reach the base of Auyán-tepui. Motorised dugout boats will also be used for transport. A full kit list will be supplied to applicants in the Expedition Handbook. Tents, safety equipment, medical and communications kit will be supplied. Teammates should consider their kit in good time in case buying, hiring or shipping is required. As a team member, you get discounts at a number of specialist stores, the details of which are provided upon booking. The tour package inclusions and exclusions at a glance. Click HereI’ve Never Abseiled. Am I Suitable?Has It Been Done?Can I Charge My Gadgets?Will There Be Telephone Signal? I’ve Never Abseiled. Am I Suitable? Can I Charge My Gadgets? Will There Be Telephone Signal? Click above to view all. As long as you fulfil the fitness and abseil requirements (in Overview) in advance of arrival and have an adventurous spirit and are willing to work as a team, you should have no problems. There are many indoor climbing centres which can do introductory courses too if you want to build your confidence in using ropes and safety equipment. Feel free to contact us to discuss in person. 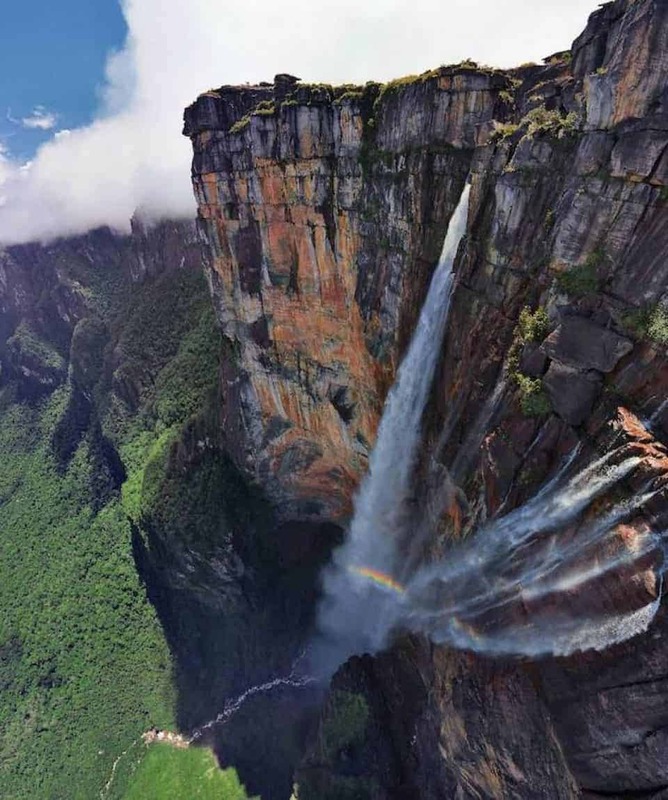 Yes, watch this BBC Extreme Mountain Challenge Venezuela episode with mountaineer Steve Backshaw for a closer look at these phenomenal falls (link might not work outside of the UK). 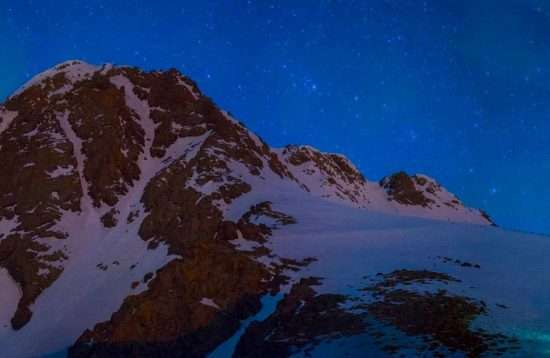 Once you start trekking there’ll be no access to mains power. Please ensure that you are self-sufficient in terms of charging your appliances by bringing things like spare batteries, lightweight solar panels or power packs to avoid frustration. There will be mobile signal in Caracas. Once the expedition starts you should plan on having no signal throughout the entire trip.